This is the process of 1) identifying anonymous website visitors by performing a ‘reverse IP lookup’ on their IP address and matching this to a company or organization name, and 2) recording, analyzing, and scoring visitors’ website session activity for sales lead follow-up. Many marketing organizations use B2B website visitor tracking software to increase revenue by providing more actionable leads to their sales teams. Many business-to-business (B2B) marketing teams know that they just don’t get enough high-quality sales leads driven by their website content and marketing campaign landing pages. They lament that not enough of their anonymous online visitors turn into visible ‘hand-raisers’… new customer prospects who want to talk to their sales teams or at least register to receive ongoing marketing content. Software tools that identify and track B2B website visitors can greatly improve this situation. They help to turn anonymous website traffic into customer prospect information that sales teams can immediately leverage. The diagram below provides a sneak peek at this category of B2B lead generation software. By turning anonymous online visitor traffic into actionable data, these tools help B2B companies discover new sales prospects that may be more receptive to direct sales outreach. Read on to learn more… and also to meet several of the leading vendors and software products that can help you track visitors to your website and turn more of those website visitors into leads. Tip: Use the navigation links directly below to jump to specific sections. Website visitor tracking, as defined above, is used by many organizations as a means of providing B2B sales and marketing teams with useful web visitor intelligence — actionable information about potential sales prospects for their products and services. These software tools are most often used by B2B companies for proactive lead generation and sales acceleration. Companies understand that only a very small percentage of their online visitors actually submit inquiry forms, sign up for content offers, or request a direct sales call. According to most B2B marketing software vendors, this percentage is as low as 2-3%. This is a painful statistic for marketing teams struggling to convert anonymous site users into quality sales leads. With that in mind, any B2B lead generation software that can help sales teams proactively engage these anonymous prospects faster is worth considering. When they work well for a company, these software tools produce high ROI and investment in them is easily justified. Several B2B marketing software vendors provide specialized website analytics tools that help identify ‘hidden’ site visitors and turn that data into sales-ready leads. I’ve profiled many of the best software tools in this category further below. Some vendors are based in the US and Canada; others in Europe and India. Many have international office locations for regionalized business development, sales, and customer support. If you’re new to this software category, take a few minutes to read more of the intro material directly below. You can also skip directly to the vendor intro section via this button. What Is Anonymous Website Visitor Identification? Identifying anonymous website visitors is the basic task of mapping an unknown visitor’s internet (IP) address to an actual company or organization name. It works in cases where there is a direct 1:1 association between an online user’s IP address and company or organization. This is also called IP to company resolution. Determining the site visitor’s geographic location and other company-specific information is also important. This is the B2B firmographic data collected based on the visitor’s IP address. Firmographic data typically includes company name, location, industry codes, business size, website address, social media profiles, top executives, etc. These visitor ID tools are at least part of the answer when B2B marketing and sales teams want to know how to track IP addresses of site visitors. Understandably, there is always a lead discovery and lead generation motive at work here. The IP-to-company mapping capability is not so useful when the mapping is simply to a broadband internet service provider (e.g., Comcast, Verizon, Vodafone, etc.). In these cases, the actual visiting organization we care about is ‘masked’ behind the service provider that provides their IP connection. Some of the visitor tracking software vendors claim to be better than others at unmasking the smaller companies that visit websites via internet service providers, with no fixed IP address. These vendors may have proprietary technology and/or databases that help improve the reverse IP lookup accuracy and usefulness for B2B lead generation. The ability to accurately filter out ISPs is an important part of this process. Worth noting: It’s usually unrealistic to expect a *very high* percentage of identification across all the incoming anonymous traffic your website receives. Some vendors claim up to ~ 30% direct mapping to actual companies. This percentage can vary widely, depending on the industry, composition of website visitors, and capabilities of the tracking software tool(s) in use. Even so… 30% is much better than 0% for your sales team, right? 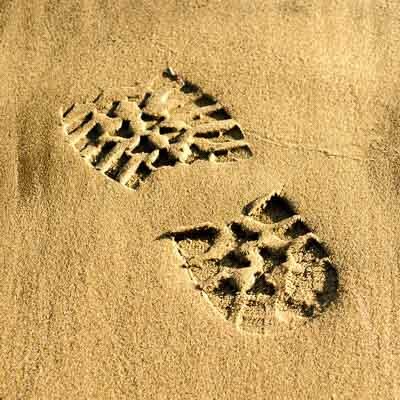 Identifying Company Only… or Individual Person? Also… and very importantly for B2B sales teams… the ‘anonymous website visitor’ revealed is typically not an individual person. It’s generally a company identification only; perhaps ‘ABC Company’ in Dallas, Texas, but usually not ‘Joseph Smith at ABC Company’. However… If the site visitor is already personally identified to the software, it’s possible that their web session activity will be collected at the user (not just corporate) level. This could happen if the user is personally signed in to a membership area of the site, or if the person visiting is already identified as an individual by CRM, email marketing, or marketing automation tools also deployed. It could also happen if the visitor’s browser has been previously tagged with a tracking cookie that allows some form of personal identification. This aspect of website visitor identification has direct implications for Europe’s GDPR data privacy compliance too… discussed in a section further below. For any of the software vendors I’ve profiled below, be sure to check with them to verify what you should expect regarding company vs. individual-level web visitor tracking in your specific implementation. Even in the more common case of only company-level visitor identification, these software tools can offer a great starting point for firms who need to improve B2B lead generation and sales targeting based on incoming web traffic. The term website visitor tracking is also commonly used for this overall software category. It goes beyond simple B2B company name discovery to actually track the visitor’s activity on the target website. This tracking includes pages viewed, time on page, and other user engagement metrics that can be useful for lead scoring and judging buyer interest and intent. In this way, it’s much like good old (and free) Google Analytics, but with extra useful data collection, reporting, and alerting features that are more directly aimed at helping B2B sales teams. We can think of this software category as having more of a Google Analytics for B2B Sales design approach. These software tools typically keep a running history of online visitor activity. This helps sales and marketing teams keep an eye on which sales leads may be getting ‘warmer’ over time… working through their buyer journeys and becoming more receptive to direct sales contact. Tracking visitor web session history and page-viewing activity is a major part of the lead scoring features of these tools. For most solutions in this software category, the tracking capability is not about following users around the web, recording personal activity from one website to another via tracking cookies, etc. So, while the notion of identifying and tracking your website’s visitors may sound a bit creepy here, it’s primarily focused on recording anonymous user activity on a B2B site, and not at a personal level in most cases. In fact, these products are quite comparable to standard Google Analytics in this aspect of user-level visibility. Worth noting: Google Analytics does not allow its users to record PII – personally identifiable information – within GA. It’s against their terms of service. These tools are also not primarily focused on reporting aggregate metrics for overall website visitor traffic, user behavior, etc. They are not intended to fully replace Google Analytics or other web analytics tools in this way. Can Google Analytics Identify Website Visitors? Google Analytics by itself provides some of the basic functionality required to identify and track anonymous site visitors… at a company level. I cover that in some detail in this post on Google Analytics and B2B IP Tracking. As outlined there, using *only* Google Analytics for this function does require Google Analytics skills that go a bit beyond the basics. It also requires extra effort to pull together custom reports that are easy to use by B2B sales teams. Maybe We Need Google Analytics for B2B Sales? Using Google Analytics by itself for revealing unknown online visitors does have its drawbacks. This is why there is an active market for more advanced and user-friendly tools. Software vendors in this segment provide tools that work alone or in conjunction with Google Analytics to provide a more integrated, comprehensive, and easier-to-use web visitor tracking solution vs. simply mining and organizing the data provided by Google Analytics alone. The next section looks at several of these software solutions in more detail. This section highlights a number of the top software vendors addressing the need for website-based lead generation. We can think of this product segment as a sales-focused sub-category of B2B web analytics tools. There are many similarities below in terms of the core visitor tracking functionality of these products. After all, these vendors are trying to solve the same essential problems for B2B sales and marketing, while adding their own special twists. I’ve included the following popular software vendors so far. Vendor profiles and their short intro videos start just a bit further below. Click on any link below to jump to a specific vendor profile further down this page. Other vendors provide their own tracking code snippets and can (presumably) provide extra functionality outside of the Google Analytics framework. Worth noting: The vendors that tap into existing Google Analytics data may also offer an immediate ‘look-back’ that pulls sales lead data from historical GA data. This can help deliver immediate payback for new users of these solutions. Other vendors have to ‘start from scratch’ based only on new website user data. Some vendors base their pricing tiers on number of unique website visitor leads provided per month, while offering essentially all product features across all pricing tiers. Others may offer unlimited users and leads across all pricing tiers, but charge more for additional features and functionality. Some vendors also allow tracking visitors across multiple websites for a single user account and monthly fee. You’ll pay based on the sum total of leads generated per month across those websites. Other vendors may require a separate subscription and monthly fee for each website tracked. In cases where you want to track companies visiting a single corporate website, this is fine. It’s probably the typical scenario. Worth noting: When pricing is based on monthly lead volumes, the issues of ISP filtering and general lead quality become even more important. You certainly don’t want to pay for ‘false positive’ leads, or waste time arguing with your software vendor about overpayments or hitting your lead limits too quickly due to ineffective ISP filtering. A few of these vendors offer completely free ‘light’ or ‘lite’ versions of their main software. These offer limited (but still useful) tracking functionality that may be enough for some. The ‘free forever’ versions are also a good way to continue using at least some of the product features after concluding a free trial period of the full version. 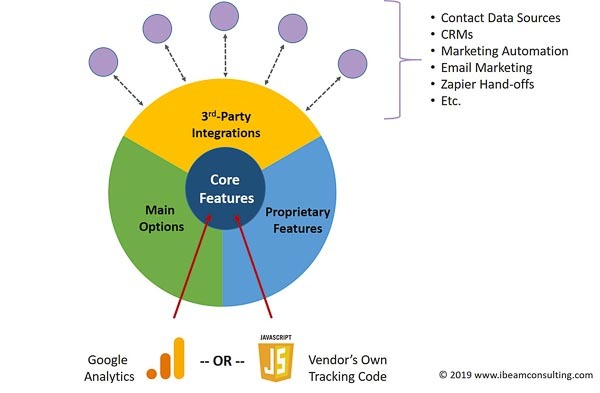 Some vendors are further along than others in terms of direct (native) technology integrations with 3rd-party CRMs and other tools in the B2B marketing technology stack. Others rely more on intermediary tools like Zapier to make these connections. Some vendors basically have all the essential (‘core’) visitor tracking features in place, but don’t seem to have much in the way of proprietary capabilities. Others claim to have proprietary technologies that improve the reverse IP company identification functionality, perform more advanced B2B lead scoring, leverage buyer intent data, etc. For example, some vendors may have better methods for resolving a specific company from the visitor’s IP data. This may be due to having multiple lookup sources, more up-to-date company databases, special unmasking capabilities, etc. Be sure to look for any add-on or proprietary features and decide what you really need and are willing to pay more for. Some of these products are very specific to the task of identifying web visitors and helping sales teams leverage the prospect data captured. They have more of a ‘standalone’ product design philosophy and focus on doing only a few things… but doing them very well. Other online visitor tracking tools are components or features of a broader B2B marketing software suite. The functionality for identifying anonymous website users is there, of course. But it’s part of a broader software suite aimed at marketing automation, account-based marketing, or inbound marketing. Software buyers should consider which approach works best for their business size and ‘organizational maturity’ in this area, future needs, budget, etc. Be a bit careful about buying into a complete marketing automation solution if all you really want right now is the ability to identify the anonymous companies visiting your website in order to generate sales leads. I personally think that this is a critical factor, aside from all the other features included in these tools. If the sales team simply won’t use a tool because it’s too cumbersome and provides a bad user experience, it won’t matter what other features the software delivers. That’s why the free trials are so useful. Be sure to get key members of your sales and marketing team heavily involved during the software trial period. B2B sales teams are always busy, so be sure to plan the software trial well in advance and get complete buy-in from sales and marketing leadership to commit people, time, and energy to the free trial evaluation. Also see this related post about managing a successful free trial of these software solutions. Let’s take a look now at some of the leading vendors and their products. I’ve listed them in alphabetical order below. And just so you know: I have an affiliate marketing relationship with some of these software vendors. I may earn a commission, at no additional cost to buyers, for future purchases made via these links. I recommend considering these software solutions for B2B lead generation needs, regardless of any purchase channel preferences or timeframe. I also donate a decent portion of my affiliate revenues to well-respected international charities and disaster relief organizations. Learn more about that here. None of these software vendors pay me to include them in this roundup or give added visibility to their information below. This is unlike some of the more commercial online B2B software directories. They may give preferential visibility and treatment to software providers in a common ‘pay-to-play’ revenue model driven by advertising, promotional, and referral fees from vendors. There’s nothing really wrong with that business model. I just wanted to point out the distinction vs. my approach. Also, I’ve reviewed some of the popular online B2B software directories and find that they broadly mis-categorize many solutions. Their filtering functions may not be very good, returning many more vendors and solutions than actually fit the specific search. In one example, while searching for B2B lead generation software with website visitor identification functionality, the directory returned 55 results… but only about 15 of those products were truly involved with identifying website visitors like the ones I’ve included below. All that extra noise just wastes your valuable time when doing product research. So, following that minor rant, let’s look below at about a dozen or so of the most popular options for tracking your website visitors with B2B lead gen in mind. Nothing listed on their website. Contact Act-On sales for pricing details. Website Prospector is part of Act-On’s overall marketing automation software suite. This includes products and features for inbound marketing, outbound marketing, CRM integrations, account-based marketing features, analytics, and reporting. Some capabilities of Act-On’s Website Prospector may work best with (or require) the implementation of other aspects of their marketing automation platform. Be sure to check with Act-On sales regarding the total cost, complexity, and implementation time required to deliver the features you truly need. Clickback WEB is a subscription-based SaaS (Software-as-a-Service) product. Plans start at $99 per month and increase based on number of unique site visits per month. Nothing listed on their website. Contact CommuniGator sales for latest pricing details. GatorLeads is part of CommuniGator’s overall marketing software suite. This includes lead nurturing and marketing automation tools. Nothing listed on their site. Contact Demandbase sales for pricing details. Unclear from vendor website if a free trial period exists. The Demandbase Engagement Solution goes beyond simple website user identification and tracking. It is part of their overall account-based marketing (ABM) software suite, which includes tools for prospect targeting, engagement, and conversion. Multiple pricing tiers starting at $24/month on an annual plan. This is a subscription-based SaaS product, with higher priced tiers offering additional features. All Leadberry plans include unlimited leads, users, and websites. Yes – 14 days. They also offer free web visitor tracking via Leadberry Light. This is a limited-function version of their main product. Leadberry is powered by existing Google Analytics data, so no further script installations are required. Multiple pricing tiers starting at $53/month on an annual plan. This is a subscription-based SaaS product, with pricing based on number of unique leads per month. In this case ‘unique leads’ means the number of companies that visit your site, after eliminating internet service providers. Yes – 14 days. They also offer Leadfeeder Lite for free visitor tracking. Like the Leadberry product approach, Leadfeeder’s free option is a limited-function introduction to the main product. Leadfeeder is powered by existing Google Analytics data, so no further script installations are required. Nothing listed on their website. Contact Lead Forensics sales for pricing details. It is based on monthly website visitor volume. Company Name: Upland Software, Inc. Nothing listed on their website. Contact LeadLander sales for pricing details. It is likely based on monthly website traffic volume and grouped into multiple pricing tiers. LeadLander is now part of Upland Software’s ‘Digital Engagement’ product family. Direct integrations with Salesforce CRM and Slack. Others available via Zapier. Pricing tiers start at under $20/month on an annual plan. This is a subscription-based SaaS product, with pricing in multiple tiers based on number of unique leads provided per month. Visitor Queue is powered by Google Analytics data, so no further script installations are required. Contact netFactor sales for pricing details. It is likely based on monthly website visitor volume and grouped into multiple SaaS pricing tiers. WhoIsVisiting pricing starts at $49 per month, with a 12-month minimum commitment. Multiple pricing tiers exist, based on number of unique website visitors tracked per month. This is initially determined during the free trial period. The software vendors I’ve profiled above are some of the most well-established in identifying anonymous site visitors for B2B lead generation. This remains a dynamic product segment that has attracted software firms and talent primarily from North America, Europe, and India. By my count (as of early April 2019), there are over 40 vendors fighting for traction and market share in this B2B web analytics software segment. Several are clearly still in startup or early growth stages, and barriers to entry seem fairly low. Home countries for these software vendors include: Canada, Czech Republic, Denmark, Estonia, Finland, France, Hungary, India, Italy, The Netherlands, Poland, Russia, Spain, Sweden, UK, and the United States. The primary vendors I’ve profiled above are from the US and Canada, UK, Finland, and Hungary. I’m working on a master spreadsheet that helps to organize and profile these visitor tracking software solutions. The first version is available now. Interested? Hit the button below for more details. The ability to unmask anonymous website visitors and track their website session activities at the actual target B2B account level is a fundamental part of the ‘inbound’ aspect of account-based marketing (ABM). An ABM approach to B2B marketing and sales directs us to spend significant corporate resources to reach specific target accounts and bring them back to our website for lead nurturing and funnel progression. So, anonymous website prospect identification and tracking plays a key role in enabling this and supporting follow-up action by the direct sales team. It also enables closed-loop measurement of our success in bringing target account prospects back to consume more of our content, engage more deeply with us as a credible solution vendor, etc. In fact, B2B marketing and sales teams who use these tools are practicing some aspects of account-based marketing, whether or not they actually refer to it internally as ABM. The related books noted further below are worthwhile for those interested in learning more about B2B account-based marketing. GDPR, or the General Data Protection Regulation, came into effect in Europe in late May 2018. GDPR is focused on improving data privacy for consumers and enforcing a permission-based approach for email marketing campaigns, among other things. In general, vendors can only send email campaigns to EU individuals who have proactively opted in to receive email communications from them. The GDPR deadline sent many B2B marketing teams into a mad scramble to comply. You may recall (as I do) receiving countless email updates regarding updated privacy policies, requests to confirm email opt-in subscriptions, etc., back in the May 2018 timeframe. Yes, GDPR was (and still is) a major pain-point and challenge for many marketing teams around the world. B2B marketing software vendors need to comply with GDPR as well, of course. Aside from being GDPR-compliant in their own outbound marketing campaigns, they also need to ensure that their B2B lead generation software products comply with GDPR. After all, software vendors in this market segment want to make sure they don’t introduce any GDPR compliance problems for their customers. So what do website user tracking tools vendors do about GDPR compliance in their products? How do they reassure their customers that all is well here? Some of the vendors mentioned above have website statements that are specific to the GDPR compliance of their products (Demandbase, Leadfeeder, Lead Forensics, and VisitorTrack are good examples here). Others make some reference to GDPR compliance within their overall privacy policies. Be sure to verify that this compliance applies to their actual product/service as well. In general, since most of these products do not identify or track anonymous website visitors at a personal level, they do not present a major problem for their users in terms of GDPR compliance. Disclosure: This section contains affiliate links to related books on Amazon. As an Amazon Affiliate, I may earn a small commission, at no additional cost to buyers, for purchases made via these links. I’ve reviewed these books and recommend them for consideration as helpful resources for B2B marketers, regardless of how or where anyone may purchase them. These are three of the top books on Amazon that are specific to account-based marketing. Click on the thumbnail images to view the listings on Amazon. A 288-page guide from two leading thinkers in account-based marketing. Includes real-world case studies of ABM in action at large IT enterprises. Relatively brief at only 120 pages, this book offers a more compact introduction to account-based marketing principles. Written by an expert in B2B software tools. A 384-page ‘dummies-style’ guide to ABM processes and tools. Written by a leader in SaaS-based CRM, marketing automation, and ABM software tools. These two featured books on Amazon can really help boost your Google Analytics knowledge. Click on the book cover images below to learn more. This very comprehensive guide (600+ pages!) may be all you need as an authoritative reference book on Google Analytics. Written by an impressive team of leading Google Analytics experts, consultants, and educators. A pragmatic and updated exploration of all major areas of Google Analytics, including new features of the latest tracking code. Not overly technical, this book will provide useful insights and tips for GA users at all skill levels. It seems safe to assume that B2B website visitors typically expect to be at least *personally* anonymous (and remain so) during and after their visit to your site. Many might be pretty turned off if they magically receive a phone call or email message from an eager vendor sales rep 10 minutes after their website visit. This prospect outreach dynamic is certainly something to consider for companies deploying this category of lead gen software. After all, B2B site visitors want to stay in control of their own buying process and timing, so B2B sales teams need to be careful about how they go about approaching an anonymous website user who has been identified by a software tool as a potential good candidate for sales outreach. Professionalism, sales finesse, and good introductory message crafting will be key for any direct sales follow-up activities. Tools that help identify anonymous website visitors and convert them into viable sales leads can certainly improve B2B marketing ROI. Even so, this type of lead generation software shouldn’t be the only answer, or a crutch for marketing teams. B2B marketing teams also have to ask: Why aren’t more of our anonymous website visitors signing up for our content offers? What can we do to make our site more engaging… prompting unidentified users to connect with us on a personal level? So, while the visitor tracking tools are doing their best to discover potential sales leads from website traffic, the marketing team must keep working to improve online conversions and turn more of their hidden visitors into willing ‘hand-raisers’ for ongoing sales prospect development. B2B software tools for anonymous website visitor identification and tracking continue to have good growth opportunities ahead. Low ‘organic’ conversion rates (visitors-to-inquiries) on a typical B2B website drive a need to find ways to deal with this reality and increase website-based lead generation. Continued pressures on B2B marketers to better leverage the corporate website for lead generation. A need to augment other tools (such as Google Analytics) with more actionable prospect data for B2B sales lead follow-up. Other trends also argue in favor of continued investment in this software category. These include B2B marketers’ growing interest in using account-based marketing tactics. We also see restrictions in other marketing channels due to things such as GDPR regulations on email marketing, and the rise of ad blockers that reduce the effectiveness of certain online marketing tactics. So, software tools to help identify anonymous website visitors appear to be here for the foreseeable future, giving B2B marketing and sales teams more digital tools for turning their website visitors into new leads and revenue. I’ll finish here with just a few questions. Feel free to add your comments below. Have you used any of the software above to identify and track anonymous online visitors? What do you like and/or dislike about them? Which other B2B marketing software vendors should I add? Software vendors: Have I missed anything critical here? Let me know… thanks! What other features do you want to see in these tools? Are you involved in account-based marketing (ABM)? How’s it going? Have you tried just using Google Analytics to identify your anonymous web visitors? How did that work out for you? David – thank you for your comprehensive evaluation of this B2B marketing software category and vendor makeup. What to Look for in a Visitor Tracking Product? As full disclosure, I am the founder of netFactor, and we introduced the very first website visitor identification product of this kind in the marketplace; VisitorTrack. 1. We provide the most-comprehensive information about the anonymous business who visits a website: across demographics + behavior + geography. 2. Complete and accurate contact record data are integrated with nothing else to buy. Full business records for the exact business contacts targeted are automatically appended. 3. B2B “Intent Data” from Bombora provides details of the research actions your web visitors are performing for your exact products and services – before they ever visit a website. 4. Reporting and instant alerts can be configured to nearly any criteria to match the customer’s business approach. 5. Our pricing is competitive with a service level appropriate for nearly any business. Hi Christopher, thank you for your great insights and points here! I appreciate you taking a moment to comment and add value to this post. I agree that G2 Crowd and Capterra are helpful for buyers doing research. Quora can also be very helpful. The buyer intent data from Bombora looks especially interesting and should definitely help differentiate VisitorTrack from the “plain vanilla” B2B visitor tracking solutions. Looks like a strong and comprehensive feature set overall. Thanks again and good luck to you and the crew at netFactor. Hello! Thanks for reading my blog content. I’m working on a new spreadsheet that captures key details on virtually all B2B website visitor tracking software products. Hours of my vendor research… and I’m happy to share it. Just drop me your best email address below and I’ll send the link to the spreadsheet download page. The first version is available now! Next update coming in May ’19. Your email address is safe here. We don't sell, rent, or give away email addresses.